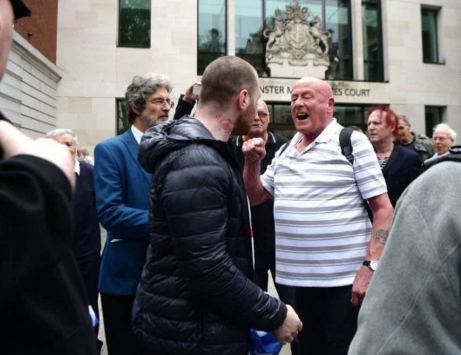 Scuffles broke out outside a court where a YouTube star who denied the Holocaust in her pop songs was convicted of creating ‘grossly offensive’ material, Martine Berg Olsen wrote in Metro on 25 May. Alison Chabloz, 53, who mocked Holocaust survivors and described Auschwitz as a ‘theme park’, is due to be sentenced on 14 June for making three anti-Semitic songs and posting them on YouTube in September 2016. 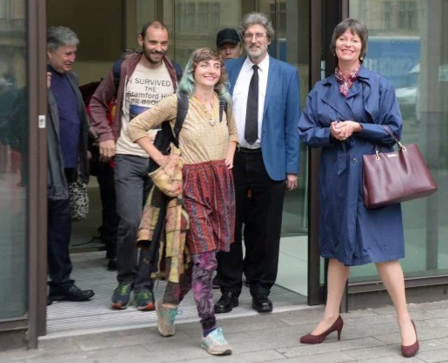 Protesters lined up outside Westminster Magistrates’ Court in London as a smiling Chabloz left around lunchtime on Friday. 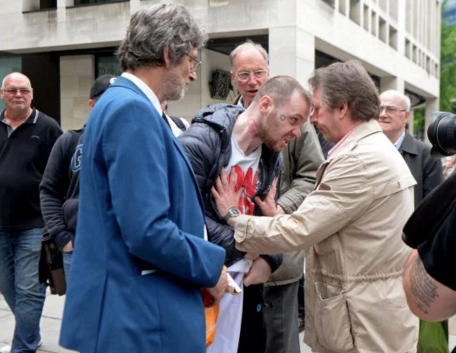 A Jewish activist holding a Israeli flag was involved in several heated arguments before he was pictured pushing a Chabloz supporter. A court officer intervened before police arrived to keep the peace. Earlier, one protester could be heard shouting ‘shame’ while another one yelled ‘justice’ from the public gallery after the guilty verdict was announced. Two of the songs, one called (((Survivors))) and another called ‘Nemo’s Anti-Semitic Universe’, were performed at a conference at the Grosvenor Hotel in London hosted by a group called The London Forum. On her personal blog she posted links to the 44-minute video of the two songs. The London Forum describes itself as ‘a conference group for nationalists, identitarians, thinkers and commentators’. She also posted a video of a third song directly onto YouTube entitled ‘I like the story as it is – SATIRE’ which she performs with a guitar in front of a microphone. She was represented by barrister Adrian Davies, who also represented Holocaust denier David Irving at the court of appeal in 2001 and was formerly a chairman of the British Democratic Party. The case was originally brought by a private prosecution by the charity Campaign Against Anti-Semitism but was taken up by the Crown Prosecution Service after previously refusing to take the case. In the song (((Survivors))) she sings: ‘We control your media, control all your books and TV, with the daily lies we’re feeding, suffering victimisation. The song also mocks Holocaust survivors Irene Zisblatt and Elie Wiezel, insinuating their accounts were made up to make money. She also questions the authorship of Anne Frank’s diary, which she again claims was a money making scam by her father. The use of the three brackets in the song’s title was known as an ‘Echo’, which is ‘a symbol devised by far right extremists to make Jewish figures more easily identifiable for the purpose of online harassment’, the court was told at an earlier hearing. In lyrics to her song ‘Nemo’s Anti-Semitic Universe’, Chabloz branded Auschwitz a ‘theme park’ and gas chambers a ‘hoax’. She described the Holocaust as a ‘Holohoax’. She also sang ‘Isra-hell is a genocidal state with no right to exist, everyone knows the score under international law’. The song goes on to say ‘Now Auschwitz, holy temple, is a theme park just for fools, the gassing zone a proven hoax, indoctrination rules’. Prosecutor Karen Robinson told a previous hearing: ‘The songs target Jewish people and no others. ‘The songs, specifically the language used within them, have been carefully considered and composed with the language chosen deliberately. The prosecution contends that the defendant’s songs go way beyond the mere expression of an unfashionable opinion about serious matters and that they go way beyond permissible satirical or iconoclastic comment. She added: ‘They are anti-Semitic, they are targeting the Jewish people as a whole and use both their content and their tone to ensure maximum offence. ‘It may be well be that some of the alleged humour is derived from the level of offence to the Jewish people. A probation officer was unable to compile a report on Chabloz, of Charlesworth, Glossop, Derbyshire, in time for today’s hearing and she will now be sentenced on 14 June.